This weeks travel treasure left me with a serious case of wanderlust and made it to my bucket list! Will you be adding it to yours? You can eat dinner or you can dine. Dinner in a desert, next to one of the most recognizable natural wonders of the world, Uluru (commonly known as Ayer’s Rock) and the dinner is called “The Sounds of Silence“. The Adventure begins as the bus pulls up out front of in the Hotel about one hour before sunset and it only takes a few minutes to to a large sand dune not too far from Uluru. You stroll up to the top where you are served Champagne and hors d’oeuvres and listen to stories from a local, as the sun gets lower, and the giant red monolith changes color’s of red. A magical start to the evening, listening to the sounds of the didgeridoo reverberating through the desert, you feel very small and yet connected to this magical place. 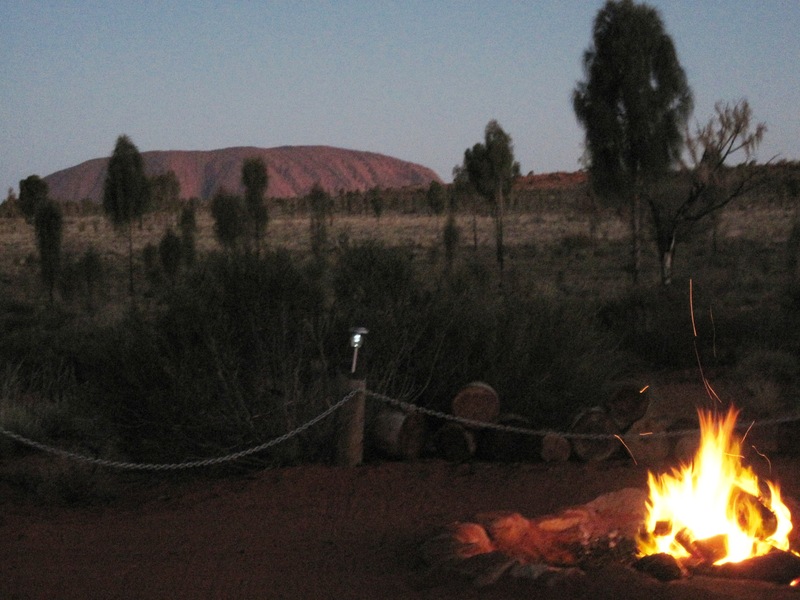 As the sun dips behind Uluru, you walk to the dining area. A series of white table cloth table’s literally set up in the desert, with an unobstructed view of Uluru disappearing into the darkness. In the darkness you can feel the presence of this incredible monolith, let your eyes adjust you can see the silhouette against the starlight. You get to feast on a BBQ buffet of Australian delicacies, barramundi, kangaroo and crocodile, bush salads and classic desserts, complemented by Australian wines or beers. The food was as wonderful, and as dinner moves along, the millions of stars come out to join you. Until you have seen the stars in the desert, you haven’t seen stars! Utterly breathtaking… After dinner a startalker, takes you on a tour of the spectacular southern night sky, telling stories of the Aboriginal dreamtime. The evening was about four hours long and has given magical memories for a lifetime. Kiwi and Koala live in Monteray (California), they can be found; tasting wine, eating food, travelling and writing about it all at Wine Walkabout. It’s an entry by yours truly this week and the third in our wonderful collection travel treasures – so be inspired and share your treasure too. Drive out of Las Vegas in a north westerly direction for around four hours and you’ll probably find yourself pretty darn close, if not slap bang in the middle of Death Valley National Park. It’s the northernmost part of the Mojave Desert, it’s hot and it’s dry – no surprise there; it’s the lowest point in North America. It’s got salt flats & sand dunes, badlands, moving rocks and hot springs, all entrapped by the mountain ranges that surround the valley. If you’ve never been, the name of the park is, in itself, enough to set you on edge, with a fairly equal balance of curiosity and caution. The questions of ‘What deathly dangers await?’ and ‘Will I come out alive?’ are melodramatic and you know it, but they persist, and try as you might, you can’t quite silence them. So you’re alert and ready, you’re braced, you’re on guard and dammit you’re prepared! You have your water, your first aid kit and you have every kind of emergency supply known to man – (not to mention a truck load of candy). But you’re not prepared at all. And you don’t even know it. 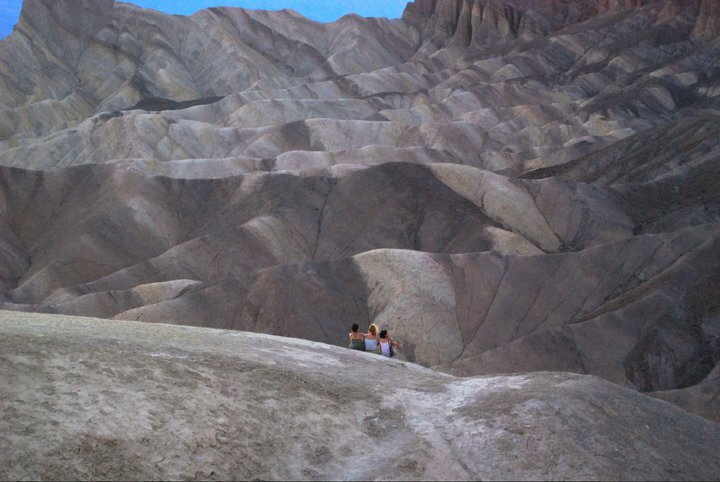 Sure – it’s definitely peppered with genuine dangers, but Death Valley is also a place of gobsmacking beauty, it’s like a karate chop coming at you from your blind spot. As prepared as I thought I was, the last thing I expected was to be enamoured by the incredible natural beauty of the painted rocks and their contrasting colours that change by the millisecond at sunset, or for my breath taken away as I watched the salt crystals of bad water basin twinkling like diamonds in the midday sun. I may have dodged death, but there’s absolutely no doubt about it – Death Valley definitely got me!